The village is quaint, has plenty of places to eat (generous portions of delicious food. 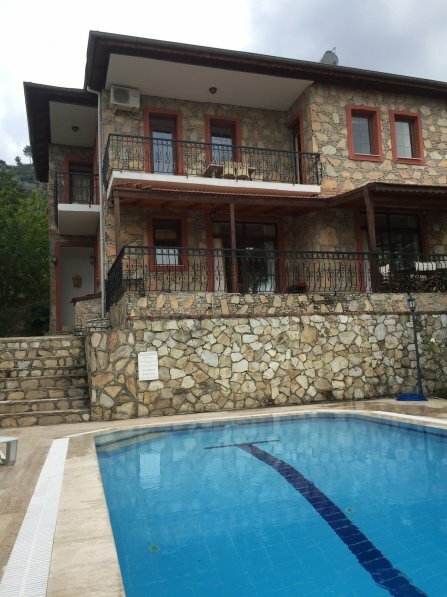 The house is a 5 min drive to the village and is a 20 min drive to Fethiye and about 25 min to the beach. Thee are many easily accessible beaches from the villa; also many great sights are easily accessible by car. Within an hour, you can visit the ruins of Cadianda, Tlos, Patara, Xanthos, Letoon, Kayakoy and Lycian tombs; also, within an hour or so, you can visit Patara Beach, Kas, Kalkan, Gocek, Fethiye, Dalyan and Dalaman. Dalaman airport is an hour away and can be reached by car or taxi. Dolmuses (mini-buses) run to Fethiye from the village square and the Tuesday/Friday market in Fethiye and the Friday market in the village are a must-see on any holiday. The village is firm favourite for ex-pats who live in the village and its surrounds. There is the option to rent a car in the village, in Fethiye or at the airport in Dalaman or Antalya. After a hot day of sight-seeing, shopping, eating out, the private pool is a great place for a cocktail, a beer or some tea. The private garden has olive trees, fruit trees and wonderful oleander and roses. A spacious patio downstairs with wide views over the surrounds and over the pool (with loungers) makes for great afternoons of iced tea or beer. The downstairs double bedroom has its own balcony and has access to the bathroom downstairs. The main dedroom upstairs is en suite, has its own lounge area, walk-in wardrobe and balcony. ostairs there is a family bathroom and two more bedrooms, each with at balcony. As an added bonus, this rental comes with a 24 hour helpline. The property manager willl help you with anything you need: taxi’s, food deliveries, directions, finding things you need etc.